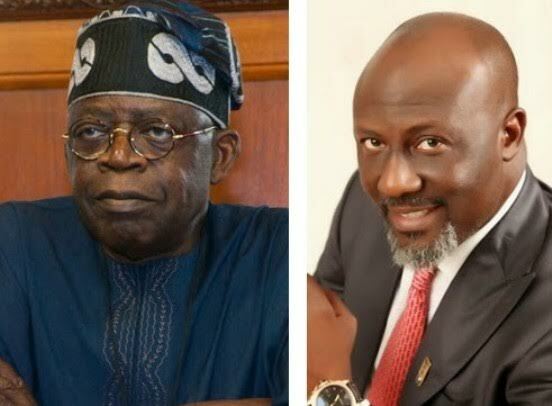 As rumble behind the senate’s Wednesday closed-door session drags on, Senator Dino Melaye on Thursday admitted that he had issues with a Senator colleague (Remi Tinubu), whom he said, called him a dog and a Thug when impeachment plot against President Muhammadu Buhari was being considered. He stated this at a press briefing after plenary on Thursday, noting that he reacted to an action of Senator Remi Tinubu, the wife of the APC’s National leader, Bola Tinubu. “At the Executive session, an issue generated controversy and while contributing, Senator Remi suddenly stood up and called me a dog and a thug, of course, I had to react,” he said. He wondered why Ahmed Bola Tinubu, while speaking through his Media Aide was asking him to apologize on altercation that erupted between equals. According to him, he was yet to confirm that such statement was actually coming from the APC National leader, insisting that if it was confirmed, he would react accordingly. Melaye said, he was addressing the issue officially because of the fear that his character would be assassinated if he keeps quiet since he has been inundated with questions as a result of the wide publication on the fracas. He maintained that he was emboldened to react each time he was being provoked, while reminding those that care to check records that he has been like that. Melaye added that he was not a hypocrite when it comes to pursuing issues of national interest, noting that in the past administration, he fought doggedly for democracy which Nigerians are now enjoying today. “You can recall that I am no coward. I have always been like this and I do not speak my mind through proxies and that was the reason I took to streets whenever the need arose, particular in defense of democracy,” he maintained.